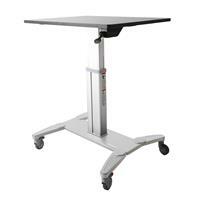 Encourage interactive classrooms and engaged learning with StarTech.com mobile sit-stand workstations. These sit-stand desks allow students to set up their learning environments to suit their needs. The workstations can easily be adjusted from a sitting position to a standing position with no disruptions to the class. Teachers can arrange and rearrange their classrooms according to their lessons, they can set up individual desks for tests or lectures, or group two or more desks together for projects. The two front casters can be locked in place to prevent the workstations from moving. Moving between sitting and standing throughout the day brings many health benefits, from increased circulation to reduced fatigue. The sit-stand workstations make it easy for students to change their positioning throughout the day, keeping them attentive and focused. Giving students the freedom to stand when needed can also help to reduce anxiety and restlessness. 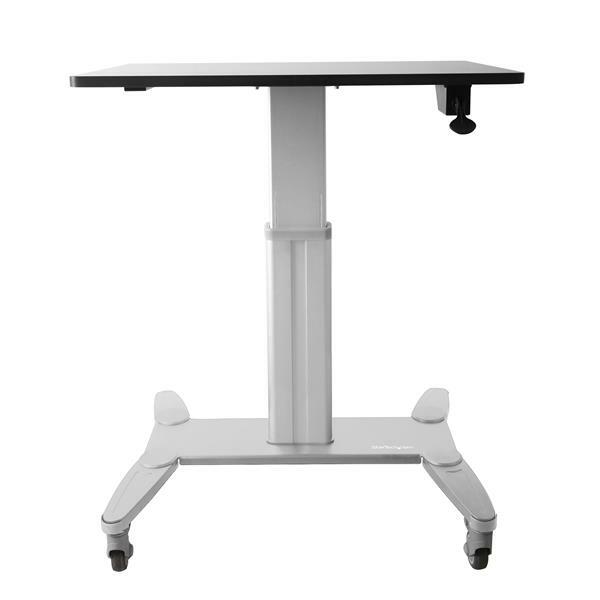 Students can adjust the desk to any height between 29.5” (750 mm) and 45” (1150 mm), they simply need to squeeze the lever located under the work surface, and then move the workstation up or down. The adjustment lever on the right side of the desktop can also be locked using the provided key, so that the height won’t accidentally change if a student knocks the lever. There are no preset heights, so each student can find the precise height they need to work most comfortably. The large surface area of the desktop, 24" (600 mm) x 31.5" (800 mm), provides ample room for all schoolwork and supplies such as textbooks, pens, and other stationery. For laptop configurations, the workstations feature cable clips that run down the column in order to help keep cables organized. The workstations can also be combined with monitor mounts to add displays. The work surface also provides enough room for a keyboard and mouse. Note: If more than 10 lb. (4.5 kg) of weight is added to the work surface, some manual force will be needed to raise the desktop. Teachers can also use the workstations for presentation purposes. The mobile workstations are ideal for moving around from class to class with laptops and other tools, and the height can be adjusted and locked. The STSCART is backed by a StarTech.com 2-year warranty and free lifetime technical support. Note If more than 10 lb. (4.5 kg) of weight is added to the desktop surface, some manual force will be needed to raise the desktop. (5 stars) Sturdy mobile desk! As I was putting this together I knew this would be a quality solution as everything felt solid but the casters definitely help making this a smooth ride! The desk is a fair size and allows for a laptop, keyboard, mouse and monitor with extra space to spare. I use this for a mobile standing station making my day more efficient. I received this product in exchange for an unbiased review. (5 stars) Great for on the go dailies! I got this product for test and took me about 25 min to put it together as the instructions are very clear and easy to understand. We are using it at our office as a mobile station with a Fujitsu scanner and it is great. The quality for this product is outstanding as it was well built and it will do the job if you are looking for a mobile solution as a school lab, medical, or anything that needs to be on the go daily. Disclaimer: I received this product in exchange for an unbiased review. (5 stars) I love this thing! I have no negatives on this one. I would like to see it go down about 3 more inches, but that's just my opinion! Assembly is fairly easy. Two people would make the final steps even easier. The casters are worth of mention. This thing rolls SO smoothly, and the two lock wheels are great. I would like to see all four wheels lock, as we ran into a scenario where using it sideways, put one locking caster out of easy reach. Again, just opinion. The whole unit is solid and stable. No wobble! The motion up and down is smooth and easy to operate. I REALLY like the key-lock to prevent accidental motion. Though, in a business environment an extra button to press and hold in order to operate the lever/mechanism would be better than an easily lost key.... The working surface is HUGE for a mobile cart like this. One suggestion? In this model or a separate one, a TILTING work surface would make this appeal to artist, home users, etc. I mounted a power strip and two Velcro strips to the bottom (to mount USB-A and USB-C hugs/network) and use this at home now, and it's taken on the roles of: serving tray, crafting surface, laptop stand, mobile workbench (I have acrylic and plywood covers I made for it), nightstand for guests... Indoors and out, it's smooth, and stable. I honestly love this thing. I received this product in exchange for an unbiased review. (4 stars) Solid desk and larger than expected. This unit was easy to assemble, my 10 year old daughter and I finished it in about 30 minutes. The desk is more solid and larger than I expected from the thumbnails on the website. The work area is a good size and easily fits my laptop, an additional display and a keyboard and mouse. The desk raises easily but requires a decent amount of force to lower it which can be difficult to apply if you have fully utilized the surface of the desk. Overall I am very satisfied with the desk and would recommend. Disclaimer: I received this product in exchange for an unbiased review. It’s quite heavy and sturdy and was a bit intimidating when I first opened the box and realized there was more than just a little assembly required. However, this turned out to be a great little companion desk and great for presentations. I don’t think I would recommend it as a workstation desk though it’s quite awkward to sit down and work at. We’ve left it in one of our conference rooms and it gets a lot of use by the presenters to place papers or a laptop on while presenting. Build quality is fantastic, everything is tight and sturdy, and the wheels roll well. I want to take it home and use it as a TV dinner stand :D I received this product in exchange for an unbiased review. Wow, this product is way more than I expected but all are great ways. I have been using this desk for a few weeks both siting and standing. The desk is very well built, sturdy and good quality. The desk came packed in a flat box (about 6" high) which required assembly. It was easily put together with the included screws and included wrenches. The table top, pole, bottom base and legs with wheels attach all came as separate pieces. The desk was larger and heavier that I thought it would be based in the images from the web site. The wheels are very good quality and can easily move across different floor surfaces. Two of the wheels can lock, which is very secure and have a quick release to unlock them. The desk has a lever to pull to allow the desk to move up and down and has a key to lock it at a specific height. I am not sure why someone would want to lock the height adjustment. The lever needs to be pressed all the way to the on position otherwise the height won't move. The desk raises easily but requires a lot of force to move it down and I have to lean my body weight on it to get it moving. The desk raises to a good height but it doesn't lower enough. The description on the website is not correct as the shortest the desk can be moved to is 31 5/8" (805 mm), which is awkwardly higher than a normal desk and not comfortable to be use for long times. As a standing mobile desk, it is great but falls short when you have to use it seated. I received this product in exchange for an unbiased review. This is a great product. Very sturdy, the rubber wheels make it very quite, it took less than 30 minutes to assemble. We put it in the hands of some nurses and they loved it.